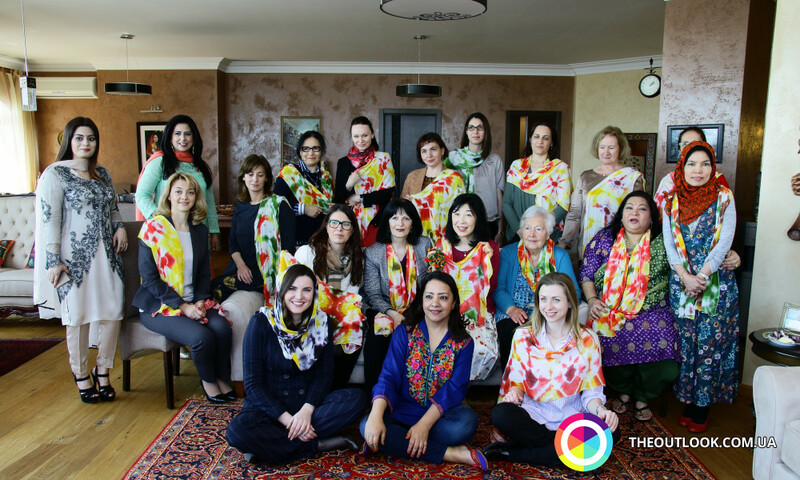 The spouse of the Ambassador Extraordinary and Plenipotentiary of Pakistan Sima Attar arranged a friendly lunch and workshop on the preparation of traditional Pakistani shawls ‘Tie and Dye’ for ‘Ambassadors Spouses Club’. Every month the association ‘Ambassadors Spouses Club’ sets up a meeting for the spouses of Ambassadors Extraordinary and Plenipotentiary, representatives of national authorities of Ukraine and partners of embassies in the course of which every country presents its culture. This month the honor to introduce community to the tradition of its nation was given to the spouse of Ambassador Extraordinary and Plenipotentiary of Pakistan Attar Abas – Sima Attar who officially greeted guests in the walls of the residence. The spouses of Ambassadors Extraordinary and Plenipotentiary of India, Japan, Malaysia, South Republic of Africa, Chezh Republic, Georgia, Netherlands, Moldova, Montenegro, the USA, Uzbekistan, representatives of Foreign Affairs Ministry of Ukraine, public activists, and mass media were happy enough to immerse into the atmosphere of true Pakistani house. Mrs Attar represented for everybody who gathered the ancient technique of decoration of the clothes, napkins, accessories, furniture, and organized workshop on the production of shawls. 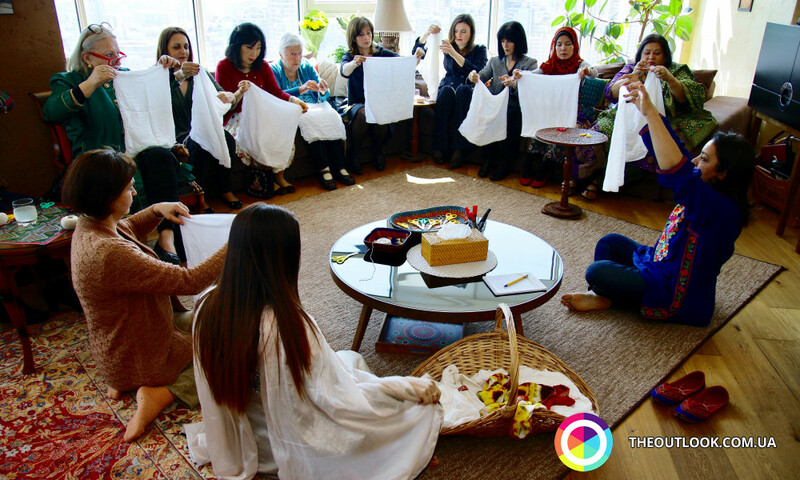 So as to make a bright shawl for all the guests it was prepared such materials as cotton canvas, threads, scissors, hold with cold, hot water and textile colorants, with salty water, and equipment for decoration. 1.The canvas from pure cotton must be put in the following way: beginning from one edge, one should roll the corner of triangle and put this triangle forward and backward until canvass has taken the necessary form. 2.Afterwards, one has to take a thread and in several places bandage triangle. The tighter it is bandaged, the less dye then fall onto these zones forming white patterns. 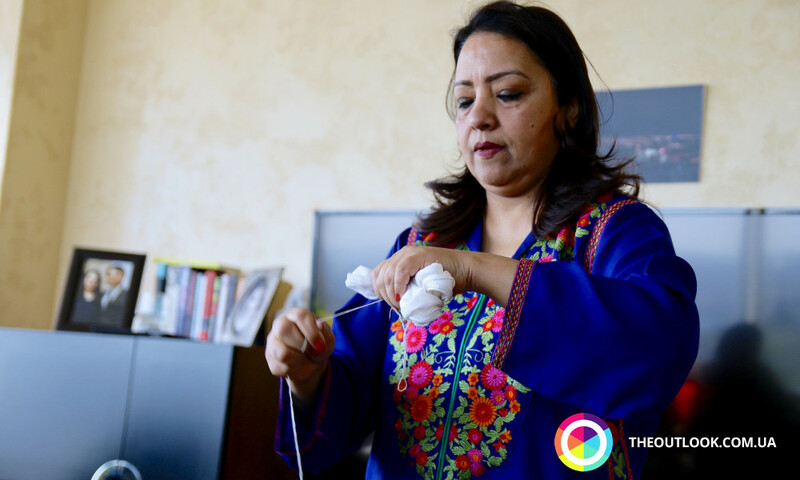 3.The white scarf tied with thread is put in the hold with cold water, soak well and wring out several times. 4.Next, the scarf soaked in cold water is put in the plate with hot water colored with colorant. One is in need of several of such holds with various colors. So as to make a scarf colorful, it is put into different colorants in different turns and from different sides. 5.Then, it is highly likely to put colored scarf for several minutes to the plate with cold salty water for fixation of color. 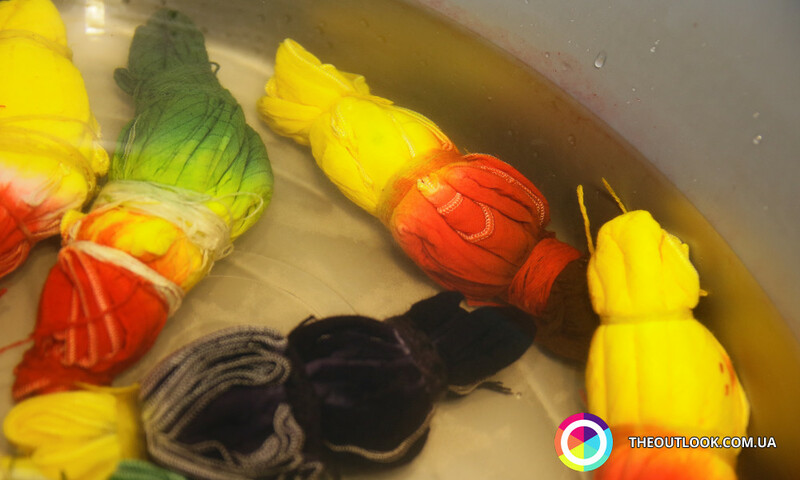 6.After that, one needs to remove the remains of color in flowing water, untie, dry out and iron it. 7.When the scarf is dried out and ironed on the edge, it could be decorated with the inkle, grinding pears, and fringe. 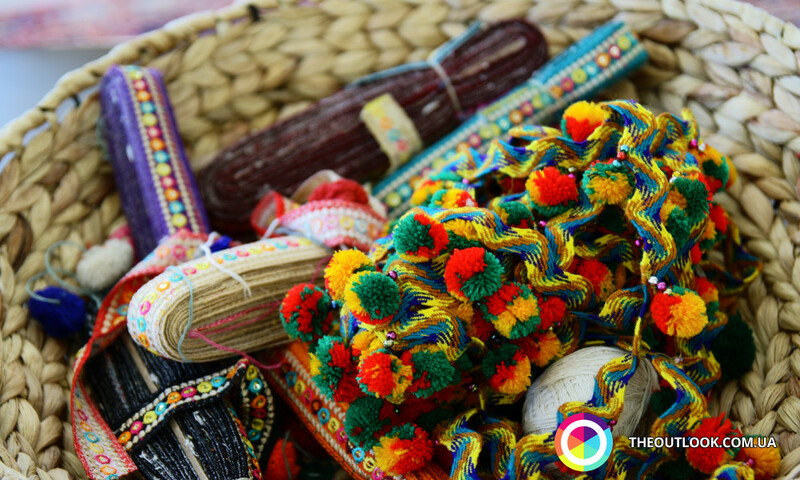 All the guests of event with pleasure participated in workshop and left for them colorful shawls, scarves and kerchiefs. 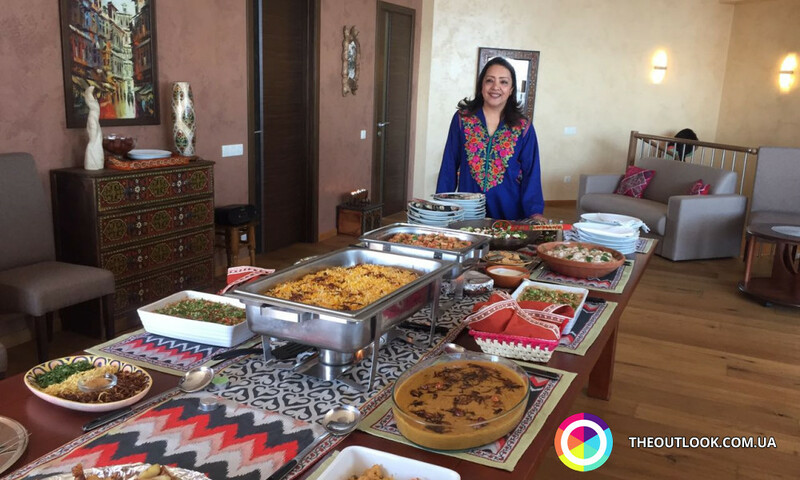 After workshop it was a lunch in the course of which guests were able to enjoy traditional Pakistani cuisine.